I love a slow-simmered tomato sauce as much as you do, but this is not one of them. Still, trust me when I say it is as tomato-y as they come, and that it’s the perfect summertime tomato sauce. It’s uncomplicated, uncluttered tomato flavour and quick–you won’t spend more than 10 minutes at the stove. “Pickled” is the only thing I can think of to describe what’s done to the tomatoes in this recipe. Years ago, a friend of my parents was visiting from Italy and he made this delicious tomato sauce for dinner one night in just minutes. My mother watched and learned that his secret was to let the tomatoes sit in vinegar and salt for a few minutes before cooking them. The vinegar really rounds out the flavour of the tomatoes, and it gets added to the sauce, yet the sauce really doesn’t end up tasting tart. The vinegar helps all of the flavours wake right up and balances the sweetness but to describe this sauce is to undersell it. It needs to be tried. And don’t forget the accoutrements. The fried basil was my mother’s genius–a trick that changes the texture of the basil and therefore how you eat it and taste it. It goes perfectly with this pasta sauce, just crunch on a piece before taking a bite of pasta and you’ll see. I’m saying this as if you’re about to go and make this right now, which I have to believe you are. If I had your phone number I would call you and ask why you haven’t made this yet when it’s so easy. So go already. In bowl, combine the tomatoes, vinegar and half of the salt. Mix well and set aside. Heat oil in a large skillet over medium-high heat and allow it to get hot (about one minute), then carefully add half of the basil leaves to the oil. It’s important to make sure that the basil is dry so that the oil doesn’t splatter. Stand back while the basil fries for about 30 seconds. Once the sizzling slows and the leaves have fried, remove the basil leaves with a slotted spoon and lay them on a paper towel-covered plate. Lower the heat and let the oil cool slightly, then add the garlic slices and crumble the red chili into the oil. Stir and cook for a minute until the garlic becomes fragrant and starts to turn golden. Carefully add the tomatoes, including the liquid, into the skillet. Tear the remaining basil leaves into the sauce, add the pepper and the remaining salt and mix well. Allow the sauce to come to a simmer and cook for about 5 minutes. The tomatoes should cook down but retain some of their texture. 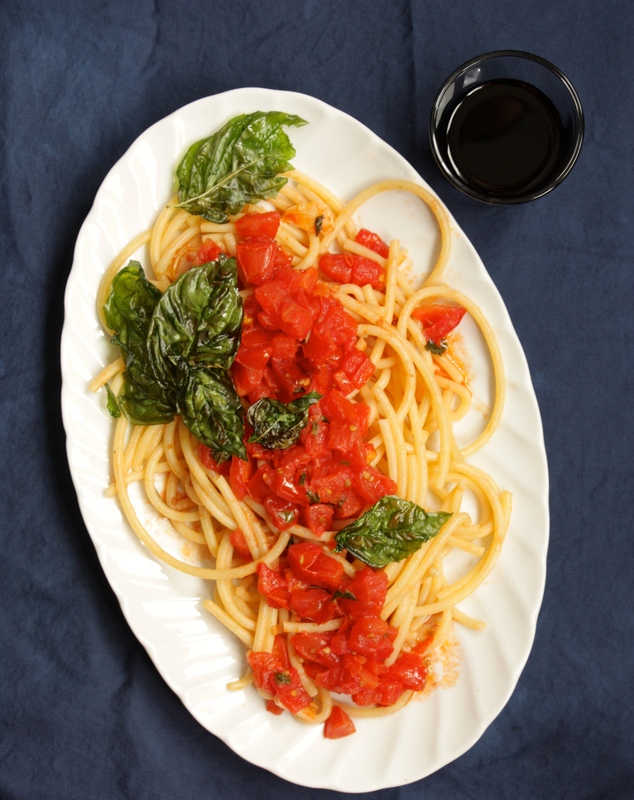 Serve immediately over hot pasta, with shaved or grated Parmesan and top with the fried basil leaves. This story and recipe appear in WE SAY TOMATO, Issue 002 of Le Sauce Magazine. Fried basil!!!!!!!!!!!!! What a wonderful idea!!!!!! !